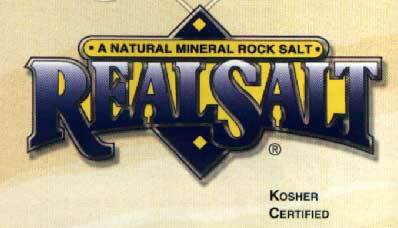 RealSalt(r) as the name clearly implies, is real, unaltered, untreated salt. RealSalt(r) is truly natural salt endowed by nature with valuable minerals necessary for good health. But isn't salt just salt? Yes and now. While most slats start out as salt, they don't always end up that way. Normal table salt begins as a saline solution. After processing and kiln drying at temperatures in excess of 400 degrees, its natural state is changed and most trace minerals are lost. Then chemicals are added like Silico Aluminate, Potassium Iodide, Tri-calcium Phosphate, Magnesium Carbonate, Sodium bicarbonate, and yellow prussiate of soda just to name a few. These are added to bleach the salt, prevent caking, and aid in free-flowing so your salt will flow free on rainy days. RealSalt(r) , on the other hand, is simply crushed mineral rock salt. It hasn't been in solution for millions of year! And it has never been kiln dried nor has it had chemicals added. RealSalt(r) is a truly natural combination of chlorides, and minerals your body needs and can use. Our customers say it is nature's best. RealSalt(r) tastes so good that many people claim it brings out whole new flavors in foods! 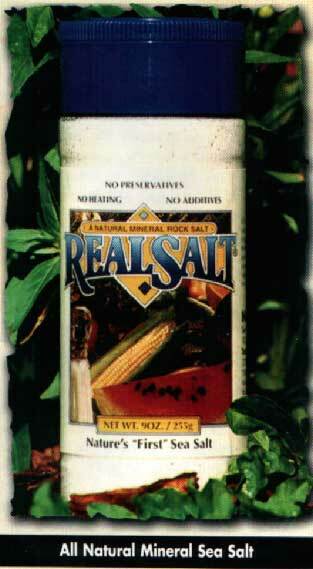 RealSalt(r)'s natural sweet flavor even cause some to ask if we've mixed sugar with it. We invite you to taste it yourself, side by side, with other salt or salt substitutes. The difference will amaze you! The pure salt flavor of RealSalt(r) comes through with no aftertaste or bitterness. Where does RealSalt(r) come from? RealSalt(r) is taken from a huge mineral rock salt deposit near Redmond, Utah, located about halfway between Provo and Bryce Canyon National Park, just off Highway 89. Here, light pink chunks of mineralized rock salt are hand-selected from this ancient deposit, crushed, screened, and then packaged assuring you the finest natural mineral salt available today. What minerals are in RealSalt(r)? Since RealSalt(r) is a natural product, the analysis may vary slightly. Below is a summary of a nalyses taken over the pst several years. RealSalt(r) contains numerous other trace minerals in minute quantities. Available in 9 ox shakers, 2 lbs bags and bulk.